Awkward smile but so excited! I have been working a huge amount of hours at work the last two or three weeks due to school book end-of-summer madness - I worked 16 days in a row, had two off, and am now in the middle of a 12 day stint. I am tired, I am not getting anything done in the evenings, I am a little bit cranky. All that was OK last week though, because I was looking forward to a very special outing on Friday after work: I bought Kev and myself tickets to Riverdance! Deedle-ee-ay-di-ay! 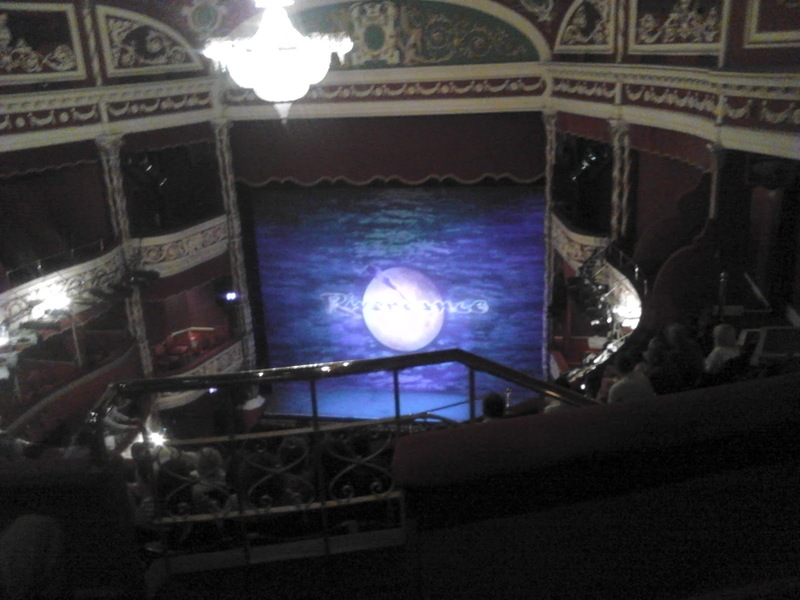 It's playing at the Gaiety Theater all summer, and I finally got my act together and booked two of the second-cheapest seats (35 euros each), which put us in the third or fourth row of the highest seating area. Sneaky, bad quality phone photo. There was a bit of a scare when Kev tried to print the tickets at his office 25 minutes before curtain and needed a password I had completely forgotten. Whoops! 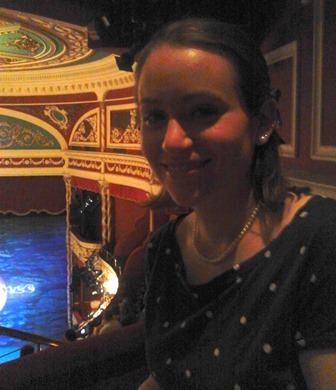 Eventually, and as usual with very little time to spare, we were taking our seats on the upper balcony. 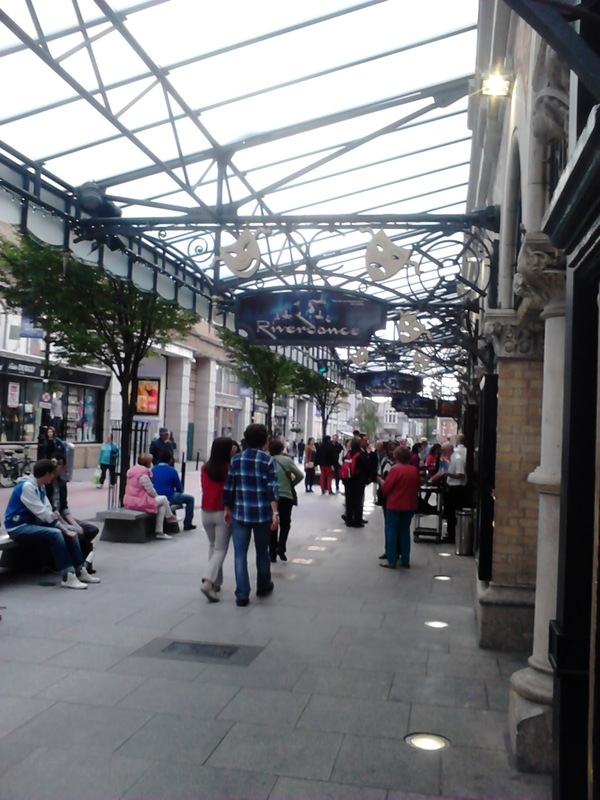 I've been in the Gaiety once before, to see an opera with Jen during first year. Kev had also seen one or two things there, but we'd both forgotten how deep the space is - it was VERY far down from our upper balcony to the orchestra seats; a really tall and narrow space. Now, when I was around 12-13-14-years-old, I was known to borrow the Riverdance VHS from the local public library. Somewhere along the way, someone also gave me the soundtrack. So, I am an enormous dork and know all the music! I was actually a bit surprised that the show has barely changed at all since the movie of it was filmed. I guess I'd been hoping for a few more surprises, but that's my own fault for having obsessed over it a decade ago. In my opinion, Irish dance and trad (traditional music) are so cool, interesting, and impressive that they stand alone and need no embellishment. Riverdance embellishes a lot: there was a lot of smoke machine action, and some very cringe voice-overs talking about the sun and the rivers and the sea. To be honest, I would have been 100% fine with all that if it had been creating some kind of overall narrative...but they weren't related to each other and told no story. It was just plops of faux Celtic mysticism for the sake of it. It seemed very much designed for a non-Irish audience. But the dancing was amaaaaazing and the woman playing the fiddle was a very commanding performer on top of being a fabulous musician. It was a fun show and a real treat to go see a live performance, and my 13-year-old self was over the moon!